This is yet another opinion, but there is ample evidence to back it up. There is no such thing as ebonized maple. In August of 2018, we have (had) three Harmony H1260 guitars branded as Regal. These all have "ebony" fret boards and bridges. We know the bridges are solid ebony because all three are broken right down the middle. They are in fact solid ebony. This wood most likely was part of the materials stock owned by the Regal company when Harmony bought them in 1955. Harmony used Regal wood to build H1260 guitars into the early 60’s. None of the three guitars we have had any date stamp. But construction techniques are the same as for early 60’s Harmony Sovereign guitars. Necks are exactly the same, except for the gear head shape. Bodies are identical to early sixties Sovereign H1260 bodies in every detail. On all of the Gibson and Harmony guitars we have worked, when there is a dyed black fret board wood, it is in fact ebony. Maybe a lesser quality ebony, not Gaboon, but it is ebony. You can not dye maple to look like ebony. Maple has annual growth rings. You can’t bleach or dye them out. Plain sawn or quarter sawn, grain resulting from the annual loss of leaves and seasonal growth will show no matter what. Besides, maple has entirely different working characteristics. Old ebony chips like crazy. Maple does not. Ebony is a tropical tree. It grows year round. I don’t know whether it drops leaves, but there are no annual growth rings. Grain is consistent throughout. Why is the "ebony" in these cheaper guitars softer and more likely to break or decompose? On some Harmony tenor guitars the fret board wood crumbles like rotten cardboard. I have seen this on LG-0 guitars too. They used a cheaper grade of ebony. I do not know what the species was, but it is not maple. Why do some "ebony" fret boards change to grey or even light brown when sanded? Gibson and Harmony and Regal were using the ebony tree sap wood and dying it to look like black ebony. Cherry, walnut, ebony and many other deciduous woods have a heart wood, and a sap wood. The sap wood is always light brown or white. Sap wood is not as hard or strong as heart wood. 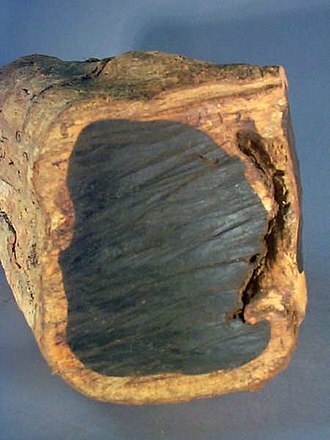 Heart wood is more dense and has dark color. You rarely see sap wood in furniture because the sawyer cuts it away and burns it for heat or for drying purposes. Any fret board that turns grey or white after sanding but has no visible grain is ebony sap wood. One of the Harmony/Regal H1260 guitars we just finished has a very nice black hard ebony fret board. However, there is a 1/32 inch layer of white on the under side. This is visible when the plastic binding is removed. So, Gibson, Harmony, Regal, and others, used everything but the squeal, so to speak, when processing the ebony logs received. Why waste materials?